If we’ve learned anything it’s that there are a lot of different plants out there. 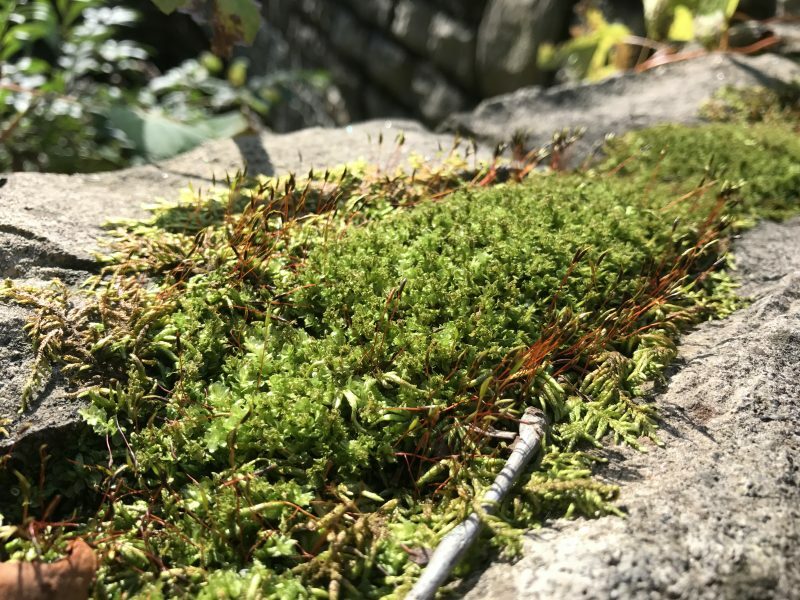 Can you imagine going out and trying to document every living plant species in a given area, from giant sycamores to teeny mosses? Talk about a nightmare. You’d have to be out of your mind. Anyway, that’s what we’re doing. 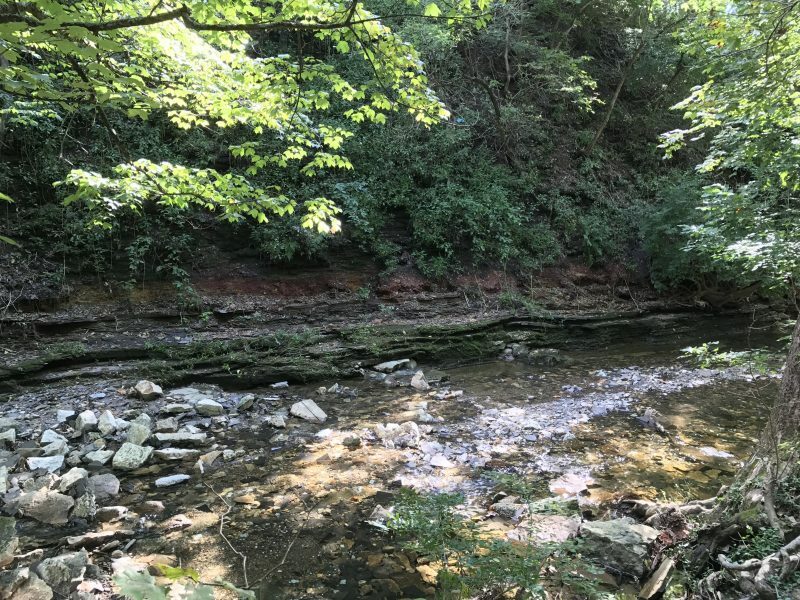 My mission is to poke around one of the cool ravines tucked away in Clintonville, Overbrook Ravine, nestled within which is the actual body of water Adena Brook. And by my mission I mean our mission, since by reading this you’ve officially taken on the same burden in a way. Congrats! But you’ll be pleased to know that I was exaggerating a bit earlier when I said every plant species. We do want to catalog a whole bunch of species, but an exhaustive list is a kind of a stretch for our purposes. Overbrook Ravine is indeed a ravine, and in many ways it’s an island of less-developed woodland hidden in an otherwise urban setting. It runs roughly East-to-West between Indianola Avenue and N. High Street, and is bordered to the North and South by E. Cooke Rd. and Glenmont Ave respectively. Adena Brook itself continues to flow west beyond the ravine proper where it drains into the Olentangy River. Here’s a cool map of the topology courtesy of Google maps. Side note: I believe all of these labeled businesses owe me money now. It’s the law. The ravine is a stretch of cool, wet woodland with fairly high cliffs composed of Ohio and Olentangy shale and Columbus limestone. Ferrous deposits color the shale a deep blood-red in some areas. On my visit I saw that the brook itself houses populations of small fish, suggesting that it is either persistent enough to support fish communities or rises often enough to allow them to infiltrate. Farther from the crumbly, rocky brook is the forested and largely flat (perhaps artificially flattened in some places) base of the ravine with moist, limey till blanketed in many areas by viney undergrowth. The ravine is dotted throughout and bordered on all sides by housing developments which have left their mark on the flow of water, rock, and soil in the system. Still, in the time since the construction of the houses, efforts have been made to preserve the ravine and the result is a pocket of woodland that is pleasantly “wild” given its urban surroundings. I’m not a geologist, so let’s talk about plants. Here’s a cluster of twigs from what I believe is a Chinquapin oak, Quercus muehlenbergii. This is a tree that I’m both surprised and unsurprised to see here. I’m unsurprised because they’re quite fond of limey woodland soil, and here there be lime. I’m mildly surprised because they’re pretty well-suited to drier habitats than this, although they’re apparently happy in bottomlands as well. These twigs were hanging out in the stream, so I’m also surprised that this particular oak has adopted a free-swimming aquatic lifestyle. I’m thinking about calling the EPA or the Coastguard. NASA? Oh, and notice the gall in the second picture! Oaks are frequently involved in the reproductive shenanigans of members of the highly-specialized wasp family Cynipidae. The gall is oak tissue that is formed in response to wasp eggs as they are deposited/developing inside. I like to think of them as nature’s gross piñatas. But no hitting. Here’s the gall that I told you to notice. Better get to it. Hey, why not check out this shrub? You like shrubs, right? Sure you do. 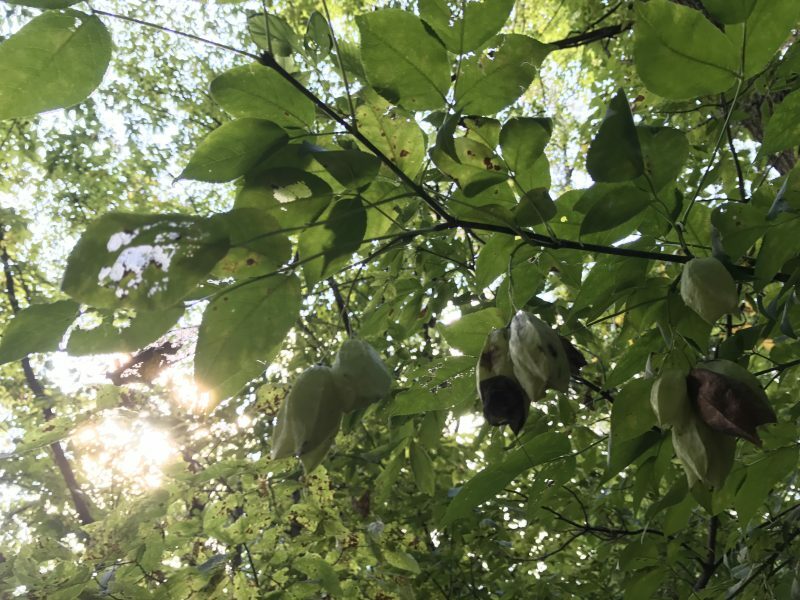 This one is American bladdernut, Staphylea trifolia. Their opposite compound leaves in groups of 3 leaflets are fairly distinctive, but what really clinches it is the fruit (which is a capsule and not a nut). Super unique among woody plants. They’re also one of the best shrubs to have with you during emergency landings over water. Yes absolutely we can do another shrub. Here’s burning bush or winged spindle tree Euonymus alatus. 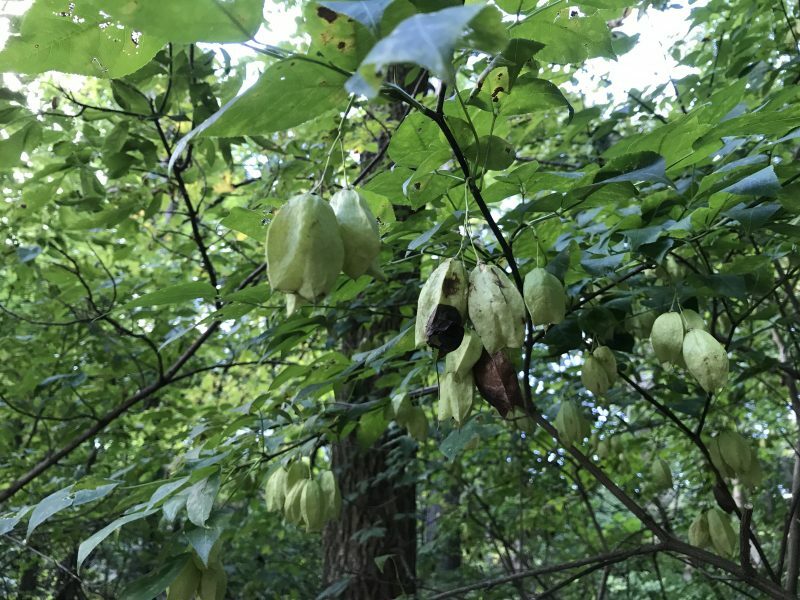 It’s an invasive plant native to Eastern Asia that’s gallivanting about the forests of the Eastern US. To my knowledge it’s still totally legal to buy and sell the plant as an ornamental, and people still do. Its super bright red leaves in the fall are the main draw. I commend the ODNR Division of Forestry for at least including the word “invasive” in the title of their database entry, but since the rest of the entry is basically “how to care for your E. alatus” I’m not sure that further praise is warranted yet. Of note are the four wings on the young twigs. They tend to break off as the branches age, and I think that’s why it kind of looks like somebody was ordered to put on a blindfold and glue cardboard to the forest. And yes, those wings do mean that this is the other best shrub to have in case of an emergency landing! I can’t believe we found both in one ravine! I’m serious, it looks like someone just dragged this thing through a Hobby Lobby and walked out with whatever stuck. 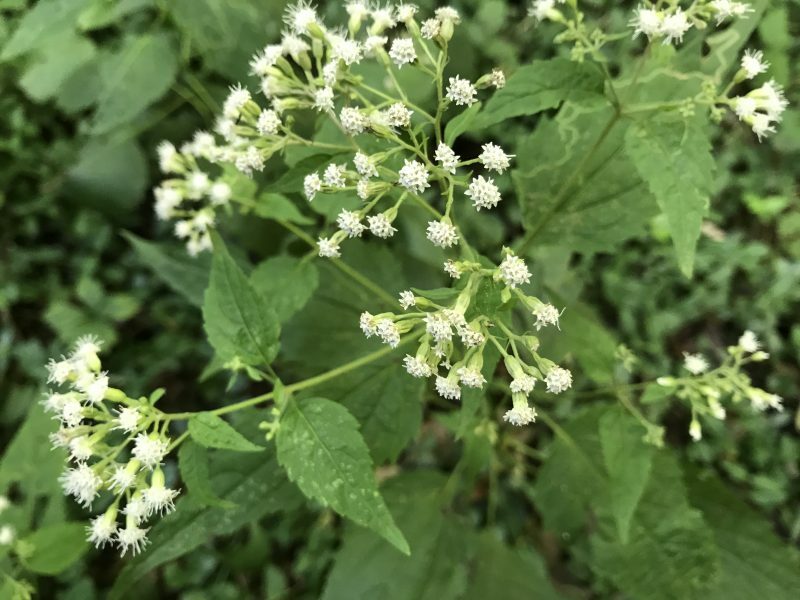 Hey, look at this white snakeroot. It’s Eupatorium rugosum, or at least it was. Nowadays it’s sometimes referred to as Ageratina altissima instead. Taxonomists, am I right? At any rate, it’s a member of the daisy and sunflower family Asteraceae. In the ravine this stuff is everywhere, sun or shade. It’s pretty happy here. It can be most easily distinguished from the similarly small and white flowers of some of the broader-leaved boneset species by its stalked leaves. Listen, don’t eat this plant. It’s poisonous. But don’t let your cattle, sheep, or horses eat it either. Still poisonous. And if they DO eat it, don’t let anyone drink their milk because now THAT’S poisonous. Back in a younger America this plant was responsible for causing “Milk Sickness”, which was pretty serious in its scope and severity at the time. So just know that, I guess, and keep up the good word vis-à-vis not eating this plant. Oh look, jumpseed AKA Virginia knotweed AKA Tovara virginiana AKA Persicaria virginiana! This is a member of the Buckwheat family. 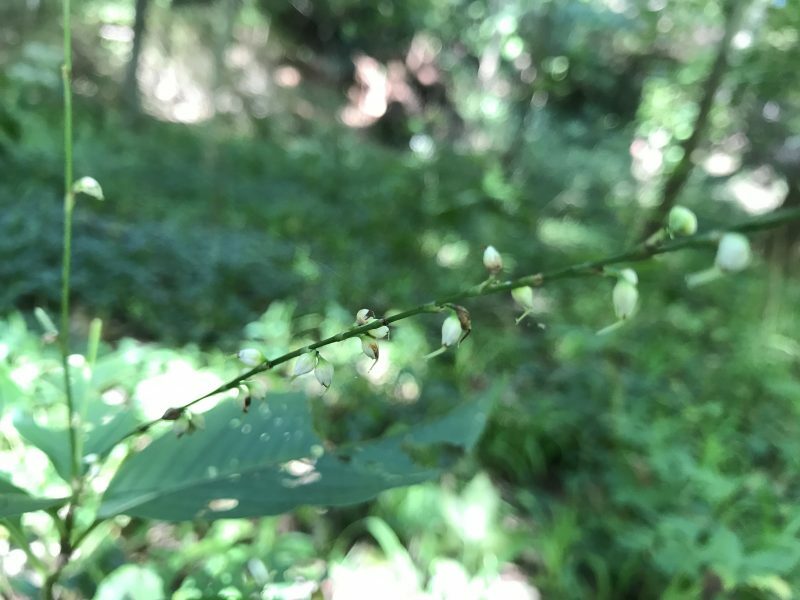 I only ran into a couple of patches of this in the ravine, which is weird since it apparently really does have a jumping mechanism by which it disperses its seeds. Just not jumpy enough, I suppose. Judging by the state of these individuals there’s also some kind of invertebrate that thinks the leaves are delicious, which might be part of the problem. These flowers were too small and the photo quality is not my fault. Too small. I wanted to include this common milkweed from the forest edge, Asclepias syriaca, just to demonstrate the fact that non-forest plants like these are absolutely dying to encroach on the ravine. Also, its fruit is a cool follicle and I think that’s worth pointing out. Look how cool it is! 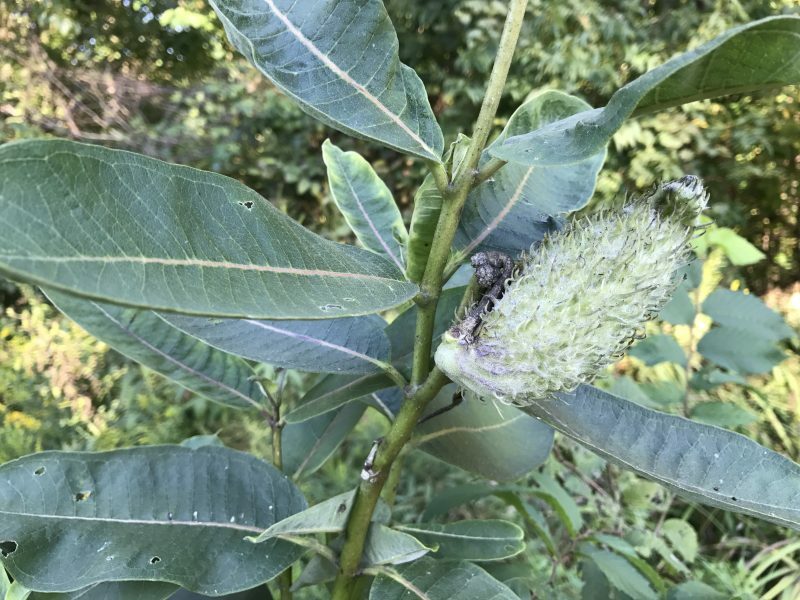 Milkweed is far from an evil plant, but some of its friends that share its light and soil preferences can be kind of nasty. As soon as the right tree kicks the bucket, naturally or otherwise, meadowy colonists are waiting right there to storm the gates and redraw the border to suit their needs. I guess what I’m saying is that we’ve got a kind of reverse Isengard situation here where the Ents are surrounded and Columbus is the orc army. Or maybe, like, Canada thistle is the orcs. What was I talking about? 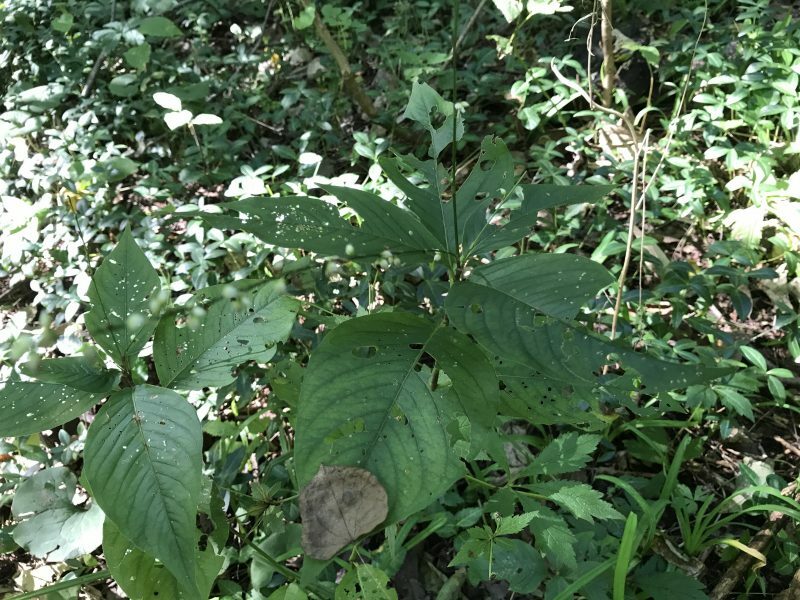 Is what someone might have said as I approached poison ivy if I wasn’t alone in the woods. In truth I was actively looking for it so I stopped short anyway, but still. It’s rough out there. If you find yourself running around the woods alone, keep an eye out for the classic “leaves of three”, but pay attention to whether or not they’re oppositely arranged. If they are oppositely arranged, you need to apologize to that boxelder because you’re being extremely rude. 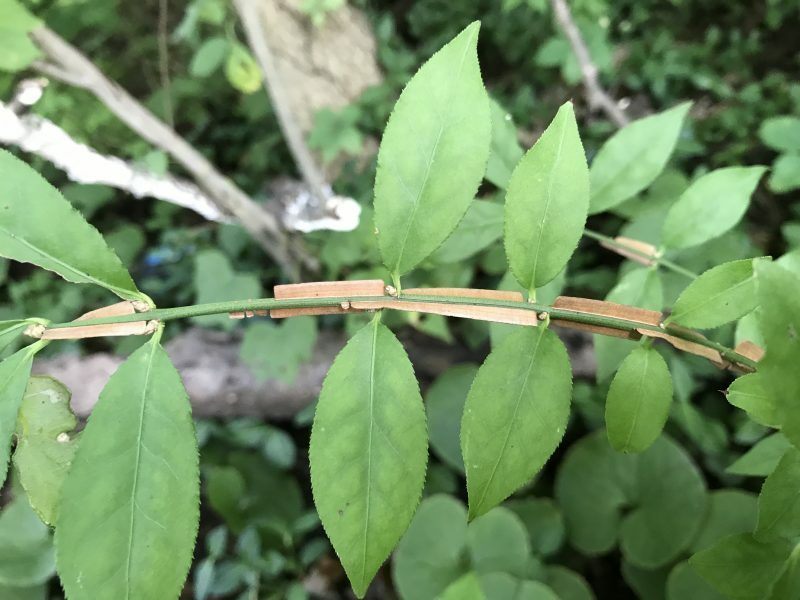 If they’re alternately arranged groups of three or it’s a vine with aerial roots and leaves of three, go ahead and run. Run even faster if you noticed shiny oil on the leaf surfaces since that’s the part that’s trouble – even if it’s transferred secondhand from clothes or dogs or toilet paper. Lichens. Are they plants? No. Are they symbiotic frameworks of fungus that host photosynthetic algae and bacteria? No. Wait, yes. Yeah, no, they actually are the second one. That was a good guess. The ravine is host to a number of lichen species, just like most everywhere else. Lichens are interesting in that they tend to be totally invisible to people even though they’re totally visible. Like, they really aren’t camouflaged most of the time. They just…aren’t noticed. Poor lichens. If you feel bad about it you should look at some lichen pictures that I’ll be posting shortly. You monster. I have some lichen photos from the ravine, and even some moss for good measure. But before we begin I want to apologize for calling you a monster. The truth is that I was projecting. 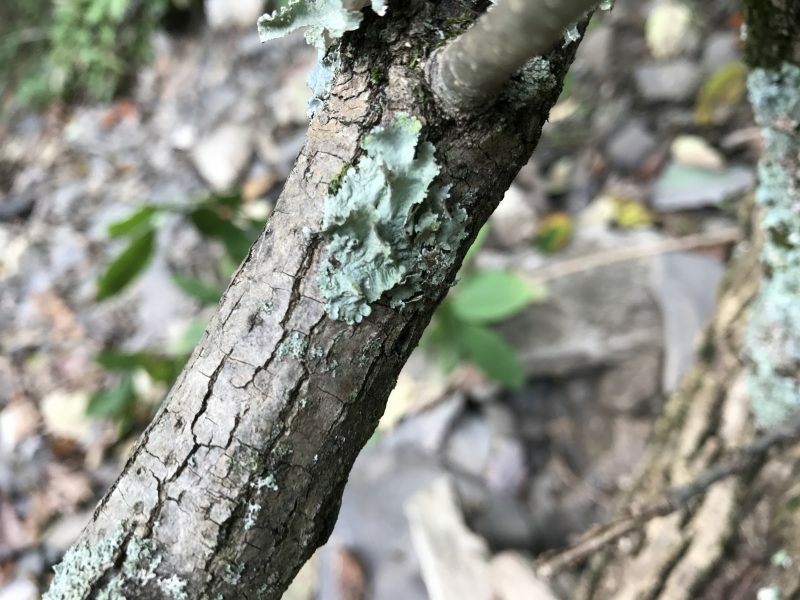 It turns out that lichens can be…kind of difficult to identify in situ. 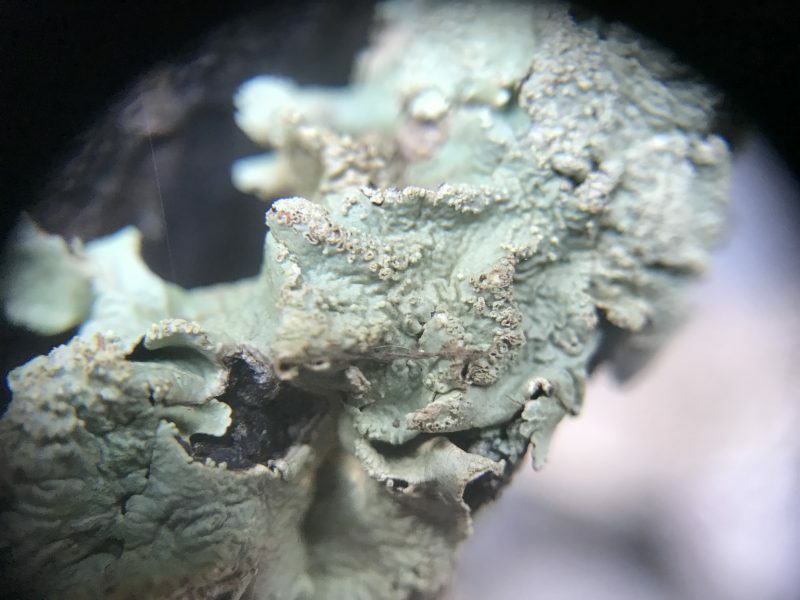 I just wanted to accuse you of lichen ignorance before someone accused me. And, even though it worked and you looked absolutely foolish, I’m sorry for what I did. On an unrelated note I’d like to try something different this time. Since we’re dealing with mosses and lichens I thought it might be fun if I just told you what species these lichens and mosses might be instead of what they definitely are. Think of it as a more interactive blog format where I playfully shift the burden of identification to you, the reader. 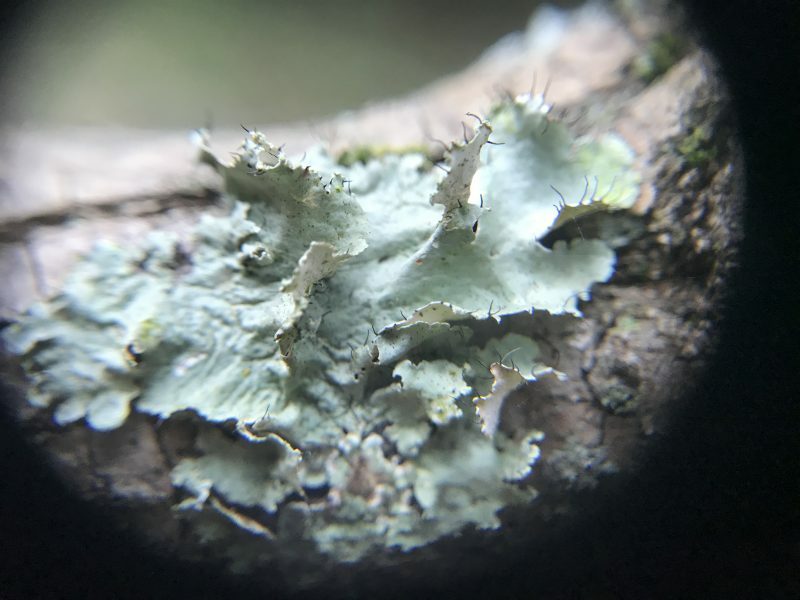 First, look at this lichen which is almost certainly a species of Ruffle Lichen, according to our handy “Common Lichens of Ohio” field guide, genus Parmotrema! This little guy could very well be Powdered Ruffle Lichen Parmotrema hypotropum. It has those cool black cilia on its margins. This next one looks like Powdery Axil-bristle Lichen (Myelochroa aurulenta) to me, but since we just agreed that I wasn’t responsible for identification this time I won’t speculate any further. I will note, though, that I think its soredia dispersed in a fun little puff when I poked it, which steered me towards the ID. Moss? Ok! Look at this Dicranum fulvum! It’s usually said to prefer sandstone substrates, but it seemed pretty happy on our Olentangy shale. If I could adopt a moss hairstyle it would be this one. Dicranum fulvum loitering under shale with its leafy liverwort friend. 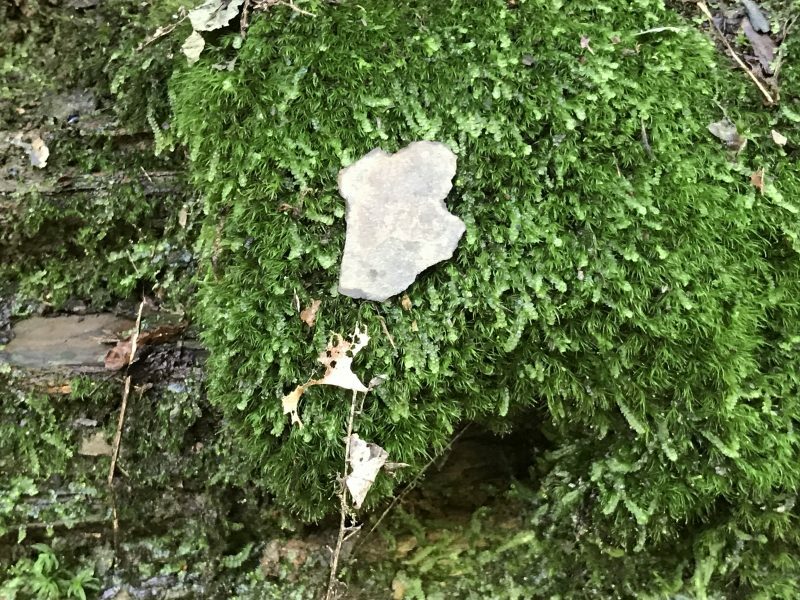 Before reading any further I want you to know that it’s perfectly natural to have certain feelings about this next moss. We all do. You’re neither the first nor the last unwitting victim of the spicy and scandalous Entodon seductrix. The Entodon appears to be surrounding and seducing a fellow moss. Beyond simply taking inventory in a given region, ecological surveys can be a metric for ecosystem health and the degree of disturbance to which the area of concern might be subjected. We can quantify these things using the same system that the Ohio EPA uses: The Floristic Quality Assessment Index (FQAI). This involves the assignment of a value from 0 to 10 to every native Ohio plant species, a “coefficient of conservatism” in order to quantify ecosystem quality. These CoC values were determined and compiled by Andreas et al. (2002) and are a great reference for ecologists statewide. Low values are given to plants that can essentially survive anywhere, perhaps with a tendency to populate heavily disturbed sites. The plants with higher coefficients are limited to very specific conditions that can only come about as the result of long-term stability, and they generally indicate a high-quality environment. We’ve referenced the FQAI to find values for our surveyed plants. 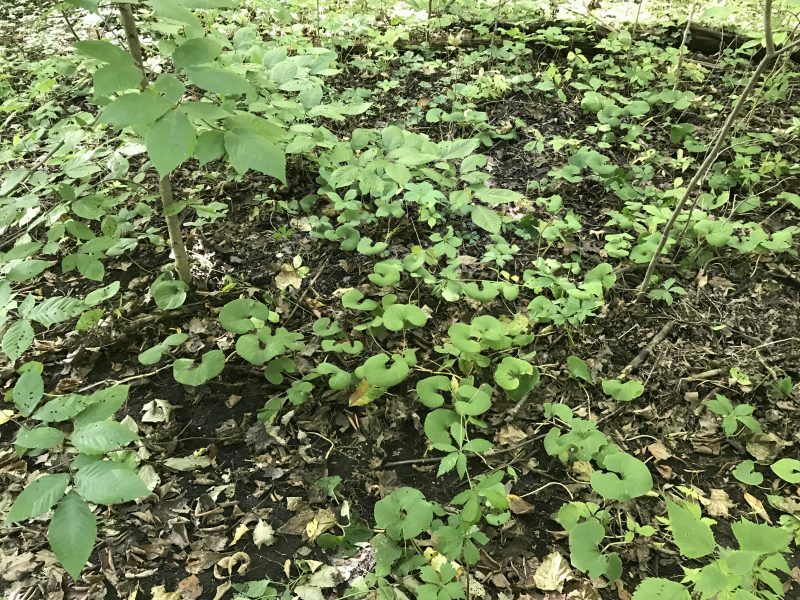 Let’s take a look at the top and bottom 4 plants in Overbrook Ravine found in our survey thus far. Since non-native plants are typically assigned no CoC I’ll do my best to exclude them from our list, even though they can be awfully weedy. We’ve actually touched on a few of these high-quality plants since they were the ones that stood out on my visits and happened to be the most tempting to document. I guess I already had a bias going in. 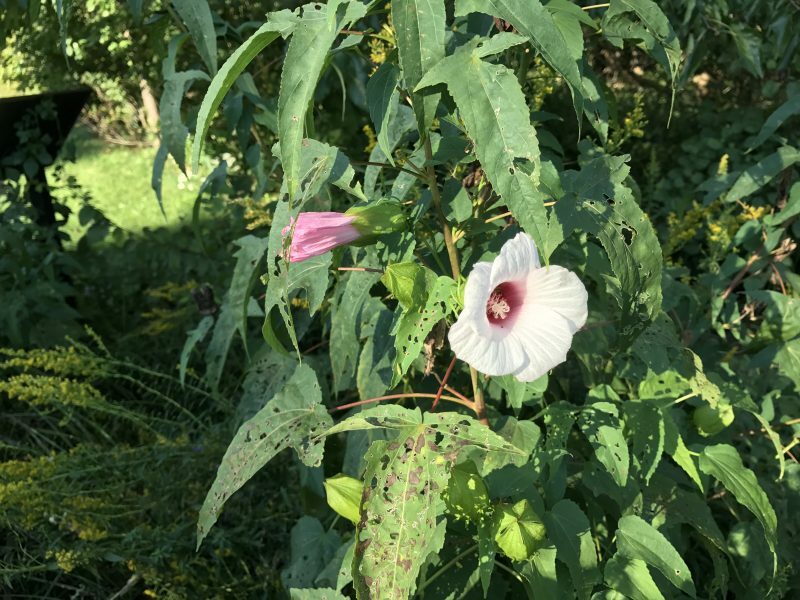 First up is one that was a surprise: Halberd-leaved rose mallow Hibiscus laevis. This, along with various un-ravine-like plants, could be found near the Wastern entrance to Overbrook drive. Could someone have planted it? Sure. Did someone plant it? BUT. It’s surviving with what seems to be very little maintenance, and as far as I’m concerned that’s dangerously close to being reestablished as a proper citizen. Besides, H. laevis is right at home by the sides of rivers and streams. The actual ravine may be a bit low on sun for this plant, but its existence in the area is absolutely feasible if you ask me. Next is a familiar face. 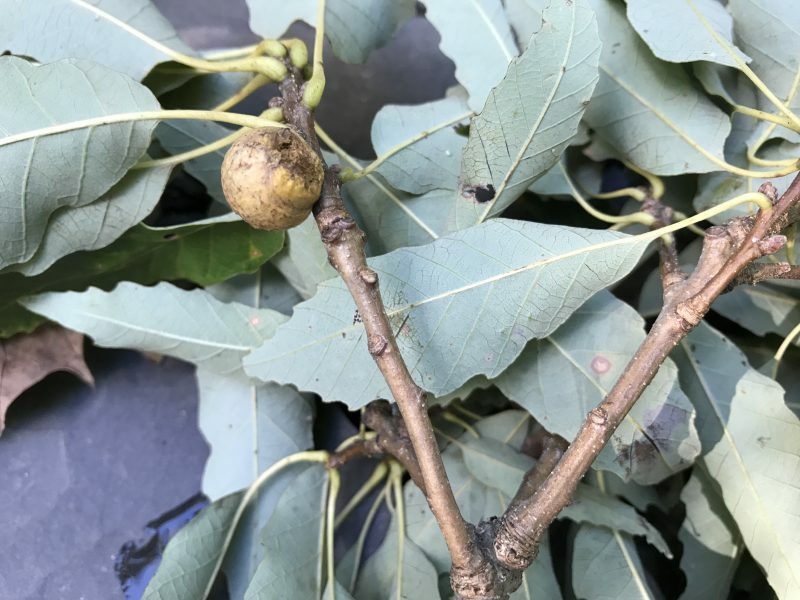 You know it, you love it, you thought we were done with it…Chinquapin Oak Quercus muehlenbergii! This calciphile just won’t quit. 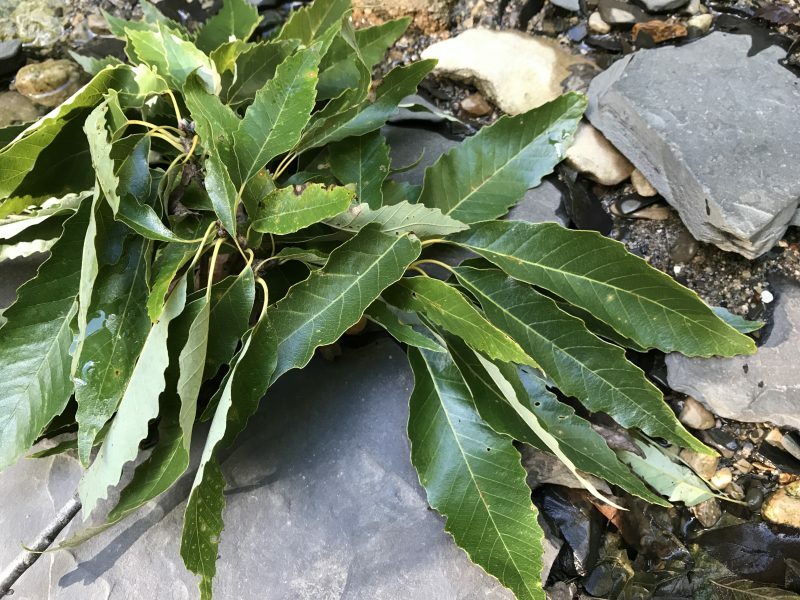 Its name stems from the fact that its leaves look similar to the unrelated and chestnut-and-not-oak Eastern Chinquapin Castanea pumila, which is a really great way to name plants that definitely doesn’t make taxonomy and botanical nomenclature a hellish nightmare. This is the part where I confess that I don’t have many backup oak photos. Here’s another familiar one. This is like a fun reunion from the top of the page. It’s bladdernut, Staphlea trifolia. According to the USDA it’s a native whose range covers mainland Eastern North America in its entirety with the exception of Maine. However, it’s listed as endangered in Florida and threatened in New Hampshire. Hang in there, bladdernut. Next up is spinulose wood fern Dryopteris carthusiana. With a CoC of 5 it’s admittedly not one of the top top-scorers, but wild ferns in the middle of a city in central Ohio are pretty cool. 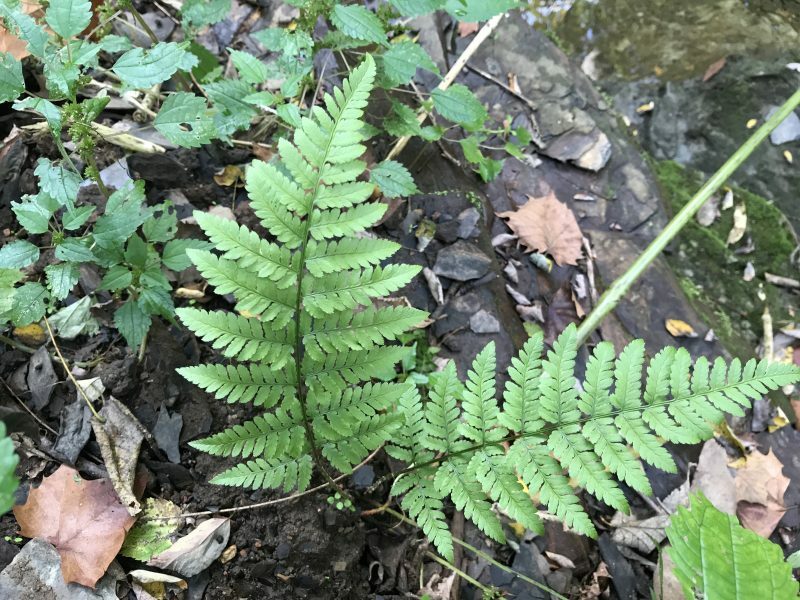 Peterson’s guide to ferns notes that it’s a tetraploid hybrid descended from Dryopteris intermedia and another, unknown parent. Its hallmark is its asymmetrical innermost basal pinnules. It also has sori that each sport a reniform indusium. 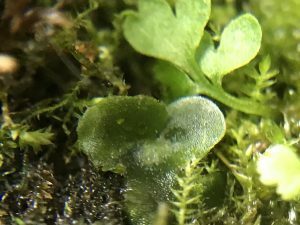 A hardworking haploid spinulose wood fern gametophyte (unless it’s a random liverwort impostor) who deserves some of the spotlight for once. Some plants are a bit weedier and may indicate instability or loss of native diversity in an ecosystem. However, their presence isn’t automatically a bad sign. These are the plants that are able to occupy a staggering range of environmental conditions, and some of them can be pretty cool. Sometimes. 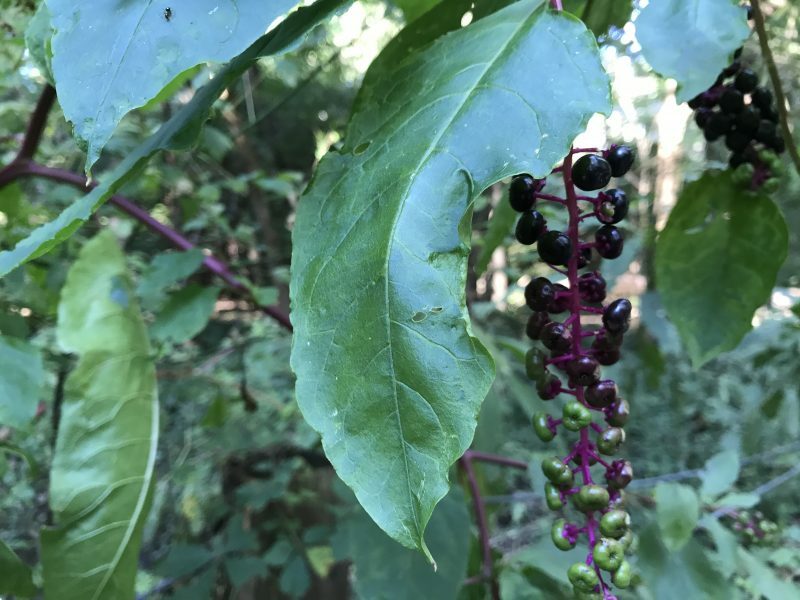 You’ve probably seen pokeweed, Phytolacca americana. The thing about pokeweed is that it’s big. Very big. This is a beefy plant. And honestly it looks pretty cool. Pokeweed is, in fact, native, but it has a hard time turning down any sunny and disturbed location. It has a fondness for forest edges, especially artificially created edges that involve infrequently maintained meadows or roads on one side. 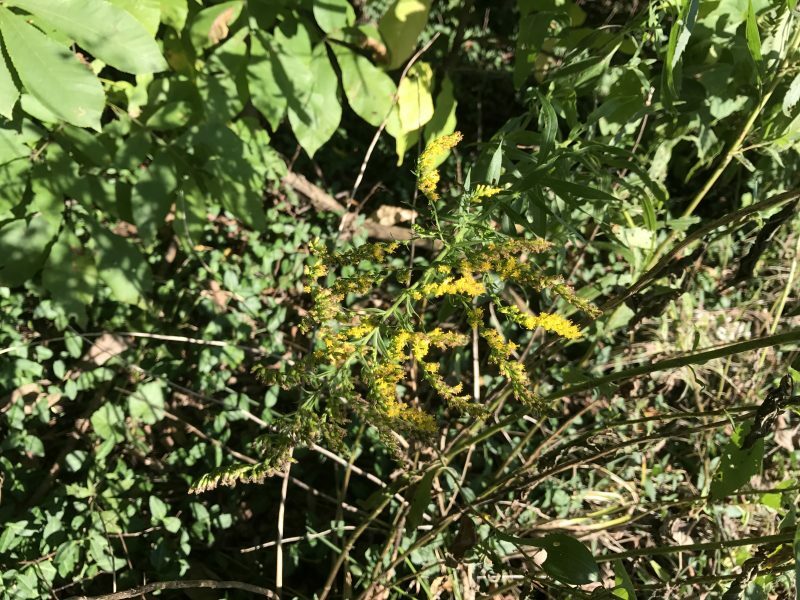 How about Canada goldenrod Solidego canadensis? This one is native around here just like pokeweed, and has a proclivity for obnoxious weediness…like pokeweed. It shows up in sunny, meadow-y locations (like the cleared “top” of the ravine) and is an accomplished colonizer. The seeds are a food source for goldfinches, and the flowers happen provide the only opportunity in the whole world for those fancy little birds to be even remotely camouflaged. Let’s talk about Virginia creeper Parthenocissus cinquefolia. Have you been in the woods? It’s all up in there. 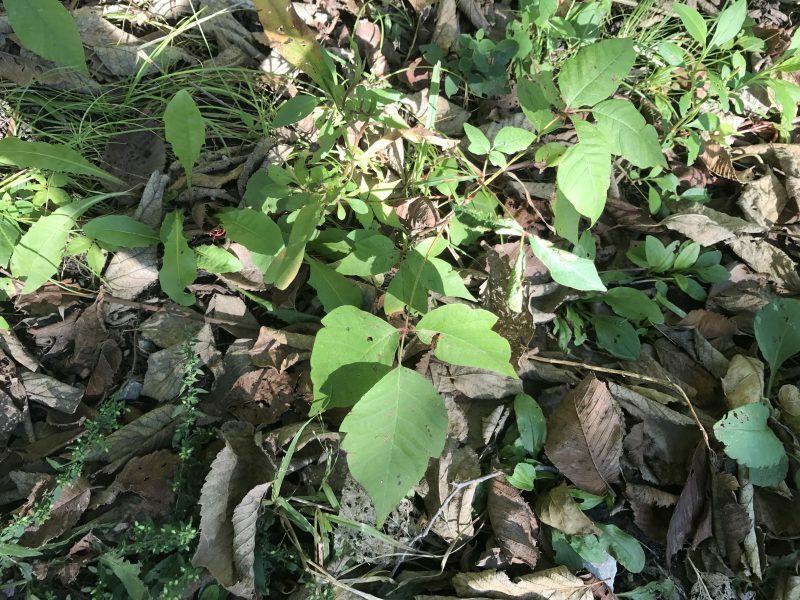 Virginia creeper is a vine that’s as happy crawling along the ground as it is climbing. Its fruits are super grape-like in appearance and super nephrotoxic in practice. It can end up dominating large swaths of shady forest, but it’s a bona fide native and I suppose it has earned that right. Its distinctive star-like palmate leaves are pretty easy to spot. Fun game: Find the creeper! Look for the stars, but watch out for the non-viney sanicle! Let’s not forget common milkweed Asclepias syriaca. The truth is that it’s CoC is low, and the truth hurts. But milkweed isn’t a bad guy. It’s just really, really good at growing in open, dry sites. And it dabbles in other soil moistures too. Weedy or not it’s an important host to the monarch butterfly, so honestly how bad can it really be? 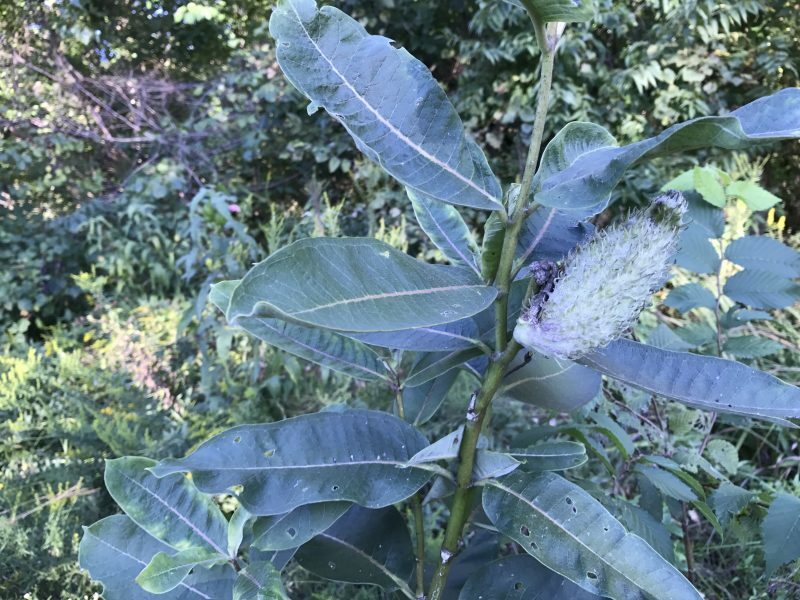 A lot of people know that milkweed produces a white, milky, latex-y sap, but did you know that it tastes absolutely terrible? I mean maybe you did know that, but I’m worried that you don’t fully appreciate the oppressive bitterness. Not that I do. I’ve never accidentally tasted it or anything. I’m not, like, an idiot. What?